ProvenExpert user interview: keynote speaker and startup coach Felix Thönnessen from „Die Höhle der Löwen“ („Shark Tank“) on the importance of positive reputations. 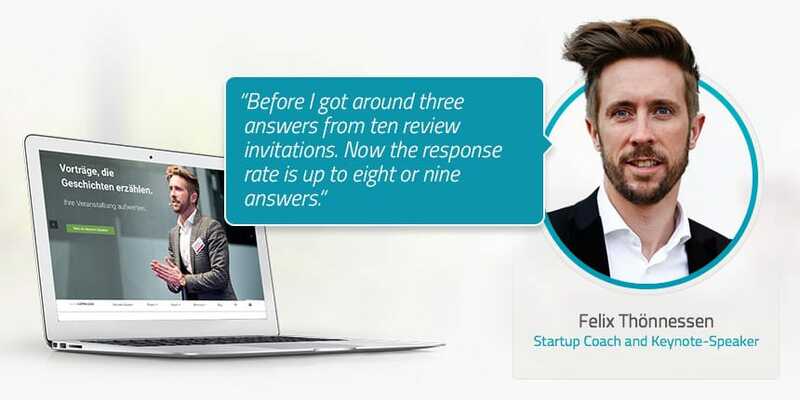 Felix Thönnessen is one of Germany's best known startup coaches. 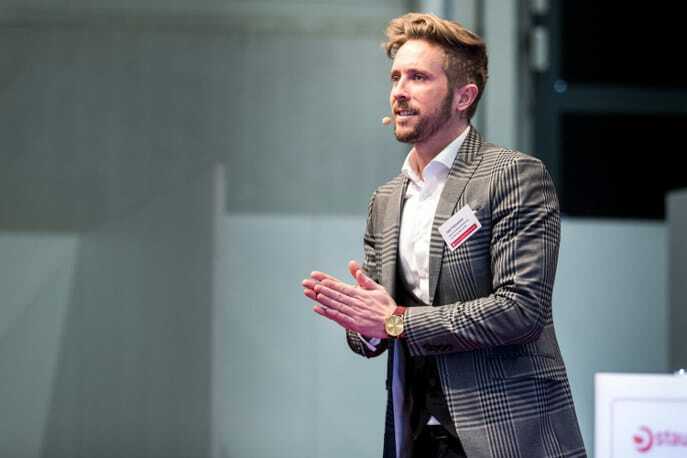 His Düsseldorf-based consulting firm specialized early on in business startups, and Thönnessen himself has become an increasingly familiar face on the Keynote speaking scene in recent years. Thönnessen is also featured on “Die Höhle der Löwen“ (“The Lion's Den“), the German equivalent of “Shark Tank“, on Germany's VOX television network. Since the show's debut in 2014, Thönnessen has served as a coach for participants. Yet despite his popularity he remains self-critical — competition is stiff, and you either stay on the ball or it's over. “Client feedback is incredibly important for me to be able to continue honing my craft“, says Thönnessen. Settling for "good enough" isn't an option for him. As he puts it: there's always room for improvement. For us it's important to make it very clear to current and potential clients that we're professionals and we're here to serve our clients. And nothing says this better than feedback from other clients, since there's a certain objectivity in what they have to say about our company. We were already collecting customer feedback and putting it on our website before we started using ProvenExpert. But ProvenExpert makes it very easy for us to collect customer feedback with surveys and display the results in a professional and illustrative way. That makes the process easier for us and our clients. We're asking our clients to use their time to give us feedback. If we can make the process quick and easy for them, then we benefit too. What are your expectations when it comes to using ProvenExpert? I expect potential clients to see the professional feedback displays on our ProvenExpert profile and feel driven to get in touch with us because they can see that we're serious about what we do. You already enjoy pretty high levels of awareness. Are there any goals above and beyond what you've already attained that you hope to achieve with ProvenExpert? Of course we've attained a certain level of awareness in our industry, and traditional customer feedback might not have the same significance for us as it does for a small-time founder or startup that needs to actively fight to make a name for itself. But for me personally, as a keynote speaker, it's very important to know what event organizers and agencies think about my work so that other event organizers and agencies can say “"Hey, let's book Felix Thönnessen"“ because my past clients were satisfied with my work. We use the ProvenExpert widget on our website so that customers can easily check the references on our ProvenExpert profile. We also use Google seller ratings as a snippet on relevant pages on our site. This really helps out a lot with search engine optimization and making ourselves easy to find on Google. We also put our “top service provider“ or "recommended by customers" award/seal “from ProvenExpert“ in “our email signature“to give potential clients a good feeling right from the start. Do you use other platforms besides ProvenExpert where customers can rate you? 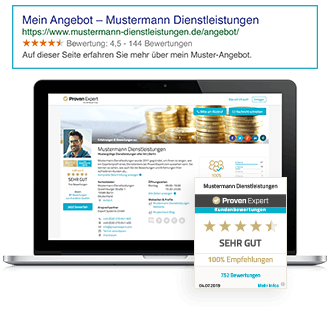 We also generate ratings via Beraterbörse, Google and the rating system on Facebook. The great — and extremely advantageous — thing for us is that we can integrate these sources in our ProvenExpert profile, and we don't need to worry about who, what, where, and when something was written. We have a sort of interface that lets us combine all our references. 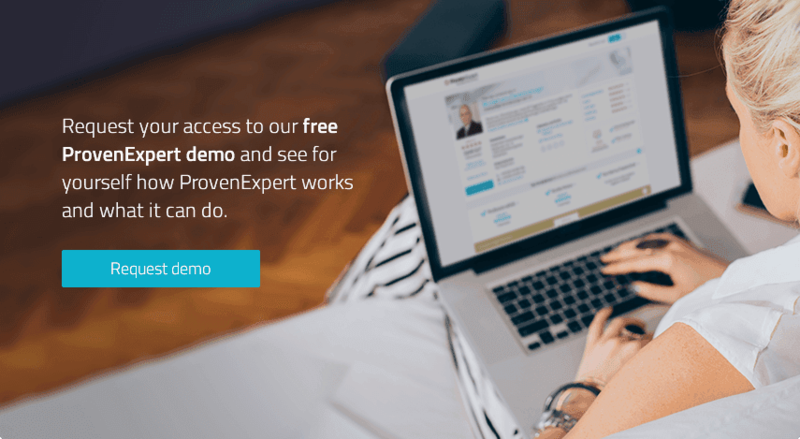 ProvenExpert provides users with the option to edit customer feedback. Have you used this feature? If not, would you consider using it? I generally think that customer feedback should be left alone, and I wouldn't want to change it. Have you acquired any new customers through ProvenExpert? It seems to us that, since we've started using ProvenExpert's ratings features on our site, we're getting more and more requests based on referrals from previous clients, and we get fewer questions as to whether we have any references in this or that industry. ProvenExpert makes it easy for us to engage potential clients because I can direct them to our ProvenExpert profile. So, ProvenExpert will also definitely serve as a sales tool for us in the long run. Have you been able to improve customer satisfaction levels? Yes, since ProvenExpert is also a tool for conducting internal quality management. We have different clients whose accounts are handled by different employees. So we're able to get an idea of how we're doing on average and are also able to fine tune how we do things internally. This is really great for us and our clients. Have you been able to measure any positive impact on your sales from using ProvenExpert? We haven't been using the tool for very long, but there have been two occasions in the last couple months where potential clients have told me that they had seen our positive rating on ProvenExpert. I think that's the reason they contacted us in the first place. One of the two requests resulted in a job for a significant amount of money. So I'd say the investment in ProvenExpert has been more than worth it. What has the response rate been like so far on your customer feedback surveys? Can you give a percentage? Honestly I'm positively surprised. Most customers give feedback when they're unhappy. And when they're satisfied with our services, then they don't want to give feedback — it's just more work for them. The ProvenExpert survey tool lets our clients give feedback in a matter of minutes by logging in to their XING or Facebook account. We currently have a feedback response rate of over 90%. And we definitely didn't have that before. It's a massive improvement. Before, if I sent out ten surveys, I'd maybe get three of them back. Now I send out ten and get eight or nine back. Excellent, that's great. What have your customers' reactions to feedback invitations been like? I think the option of giving a star rating or leaving personal feedback is the ideal combination. Both types of customers are out there: Some just want to click on a few stars and be done with it. And then there are people who “would gladly take the time to give you written feedback.“ So, our rating tool is catering to how our customers are, not the other way around. Have the online surveys helped you identify any personal strengths or potentials? Yes, definitely. We look at the ratings very closely to see which areas (service, quality, etc.) are getting positive feedback. But for me it's most informative when customers leave written reviews. I mean, when someone says “our processes were great“ but they would have liked “to have been contacted sooner“, then that's really helpful for us. In this particular case it's becoming increasingly important for us to make sure that the level of personal engagement in our responses doesn't suffer, since we're getting so many new requests and the company is growing. So now we're handling cold calls quite a bit differently than we used to, and that's allowed us to achieve the same level of quality as before. You're also a reseller for ProvenExpert. I'd be interested to know what kinds of arguments you use to convince potential customers to start using ProvenExpert. Naturally one of the main reasons is that we have so many startups and founders among our clients, and for startups and founders it's tremendously important to be able to generate some kind of objective reputation. Startups are only on the market for a very short period of time — they need seals, they need trust. And ProvenExpert is a great tool for that.